I know that series authors have been in the practice of writing short stories for anthologies and on their websites to keep fans involved while they are waiting for the next book to come out. There is a new trend, though, that I have noticed since the advent of eReaders and the rise of the Indie Authors. This trend is for authors to write short novellas that are not just stopgaps in a series, but that are stand alone stories all their own. Not that the art of the short story is new. Authors have been writing short stories forever. The likes of Ernest Hemmingway, Mark Twain, J.D. Salinger, and Flannery O'Connor have been writing short stories and novellas for quite a while. What makes this trend new, though, is twofold. First, many of these stories are being written by Indie authors, and secondly that they are being offered only in an electronic format. This new practice is a hit with me, especially since I am participating in a year long challenge to read one short story or novella per week for 2013. Recently, I read two such novellas by one of my favorite new authors, Kathleen Valentine; The Crazy Old Lady in the Attic and The Crazy Old Ladies Revenge. I have to admit, my mother read the first story when it was first published, but I didn't get to read it until recently. I really wish that I had read it sooner. Mattie and Stan inherit a Beacon Hill townhouse from Mattie's Grandmother on GrammyLou's death. 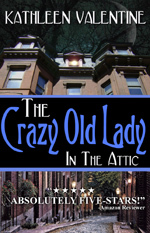 In The Crazy Old Lady in the Attic, the first story in Kathleen Valentine's Crazy Old Lady series of stories, they decide to spend the summer living in the townhouse so that they can fix it up and sell it. As they sort through GrammyLou's belongings, a story unfolds that has Mattie and Stan intrigued and nothing will do but for them to figure it out. This story had me intrigued, too, from beginning to end. I have a thing for psychological thrillers and this one, though short, is up there with the best. In true Kathleen Valentine style, this story is so well written that I became immersed in it. I sat down to begin reading it and before I knew it I had come to the end. The end itself left me satisfied, but at the same time, wishing for more. Another story would be just the thing. 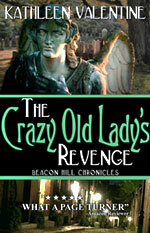 The Crazy Old Lady's Revenge is the second story in Kathleen Valentine's Crazy Old Lady series. Like the first story, The Crazy Old Lady in the Attic, this story is a first rate psychological thriller. In fact, I liked the story line for this one a little more than the first. The story line here was more complex than the first one and I really had to pay attention. I loved the way that Kathleen dropped clues throughout the story. I was constantly guessing at where the story was leading, and constantly changing my mind, too. Along with the great story that Kathleen weaves in this story, was a great cast of complex characters, some of whom are not what they seem at first. I can't wait until the next story of this series comes out, but luckily, I have several other stories and novels of Kathleen's to read while I wait. I have been a huge fan of Kathleen Valentinesince I read The Old Mermaid's Tale and another of her short stories, Ghosts of a Beach Town in Winter. So far everything that I have read by this author has been excellent, she is all that is wonderful about Indie authors. For those of you who like psychological thrillers, don't wait on these . Read them now! You won't be sorry. You are welcome, Kathleen. You know my Mom and I are both big fans.